Today, I tell you how to audit plant, property, and equipment (or capital assets if you work with governments). 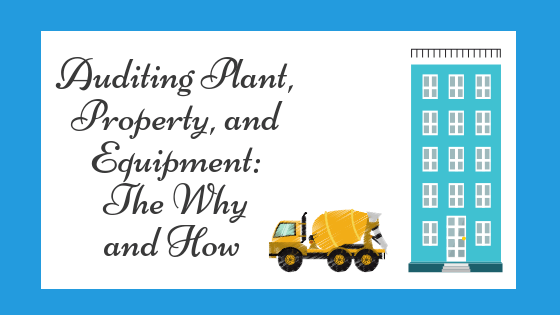 Plant, property, and equipment is often the largest item on a balance sheet. But the risk is often low to moderate. After all, it’s difficult to steal land or a building. And the accounting is usually not difficult. So the dollar amount can be high but the risk low. I will—at times in this article—refer to plant, property, and equipment as property. Governments use the term capital assets to refer to plant, property and equipment, but again, I will, for the most part, use the term property in this article. Property is purchased for use in a business. For example, a corporate office might be bought or constructed. The building is an asset that is depreciated over its economic life. As depreciation is recorded, the book value (cost less accumulated depreciation) of the building decreases as depreciation is recognized. In other words, you expense the building as it is used. In most reporting frameworks, including GAAP, assets are recorded at cost. Appreciation in market value is not recorded, but significant decreases, known as impairments, are booked. Property improvements (e.g., adding a new room to an existing building) are capitalized and depreciated. Repairs (e.g., painting a room) that don’t extend the life of an asset are expensed. Also, most businesses elect to use a capitalization threshold such as $5,000. For these entities, amounts paid below the threshold are not capitalized, even if they extend the life of the asset. The amounts below the threshold are expensed as incurred. So, how do most entities track property purchases and compute the related depreciation? They use depreciation software. Then when property is purchased, it is added to the depreciation software and an economic life (e.g., ten years) is assigned. Of these assertions, I believe—in general—existence, occurrence, and classification are most important. So, the client is asserting that property exists, that depreciation expense is appropriate, and that amounts paid for property are capitalized (and not expensed). As we perform walkthroughs of property, we are looking for ways that property might be overstated (though understatements can occur as well). Are property ledgers reconciled to the general ledger? Does the entity use reasonable and consistent depreciation methods? Are the economic lives assigned to property appropriate? What controls ensure that property is recorded in the right period? What controls ensure that capital leases are capitalized as property (if applicable, see GAAP lease standards)? Is there appropriate segregation of duties between persons that purchase, record, reconcile, and physically possess property? What software is used to compute depreciation? Does the company perform periodic physical inventories of property? Are assets removed from the depreciation schedule upon sale? What controls ensure that property purchases are added to the depreciation schedule (and not expensed as repairs and maintenance)? 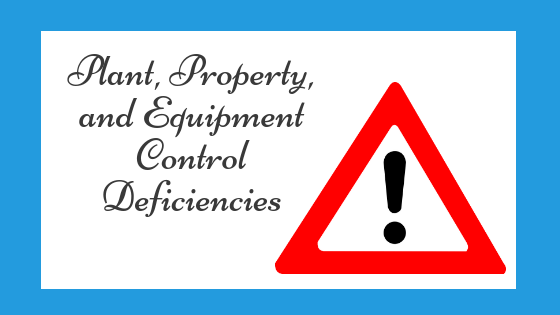 What controls ensure that repair expenses are not capitalized as property? What is the capitalization threshold (e.g., $5,000)? As we ask questions, we also inspect documents (e.g., depreciation reports) and make observations (e.g., who has access to moveable property?). If control weaknesses exist, we create audit procedures to respond to them. For example, if—during the walkthrough—we see that one person purchases property, has physical access to equipment, and performs the related accounting, then we will perform theft-related substantive procedures. The directional risk for property is overstatement. So, in performing your audit procedures, perform procedures to ensure that property is not overstated. For example, vouch all significant property additions to invoices. See if the amounts added are equal to or greater than the capitalization threshold (e.g., $5,000). In smaller engagements, I usually assess control risk at high for each assertion. If control risk is assessed at less than high, then controls must be tested to support the lower risk assessment. Assessing risks at high is usually more efficient than testing controls. When control risk is assessed at high, inherent risk becomes the driver of the risk of material misstatement (controls risk X inherent risk = risk of material misstatement). The assertions that concern me the most are existence (for additions to property), occurrence (for depreciation), and classification (of property). With regard to classification, the business determines whether the amount should be capitalized or expensed. So my RMM for these assertions is usually moderate to high. My response to higher risk assessments is to perform certain substantive procedures: namely, the vouching of additions to property. As RMM increases I lower the dollar threshold for vouching property additions. If controls related to bids are weak, your RMM for existence can be high. Bid rigging or kickbacks—fraudulent vendor actions—can result in overstatements of asset additions. In this article, we looked at how to perform property risk assessment procedures, the relevant property assertions, the property risk assessments, and substantive property procedures. Next it’s time to turn our attention to the audit of accounts payable and expenses. Wow Sir I must say I really gained a lot today. In my little experience in audit I am aware of most of the procedures but there a quite a number that I am not aware of. In the light of my new discovery I intend to follow through.But the challenge I usually experience is the short time span to complete an audit and the fact that my firm still prefers to use manual methods. Chika, glad you learned a lot from the post. Thanks.